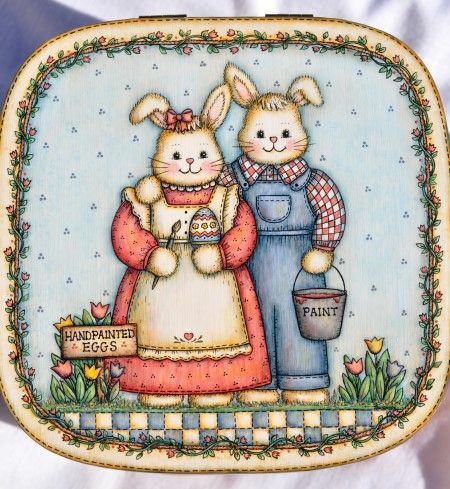 Featuring two bunnies painted on the lid of a basket with a painting surface measuring 7” x 7”. The girl bunny is holding an egg and paint brush and the boy bunny is holding paint. A “Hand Painted Eggs” sign is in a bed of tulips and a border vine of tulips surrounds the design. This packet also includes three bunny eggs, “Bunny Holding a Tulip” painted on a hen size eggs, “Bunny holding Three Tulips” painted on a goose size egg and “Bunny Holding Egg” painted on a hen size egg. 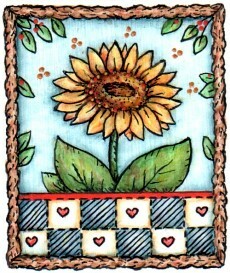 This packet contains: Complete directions, three colored photos and two full size pattern pages.